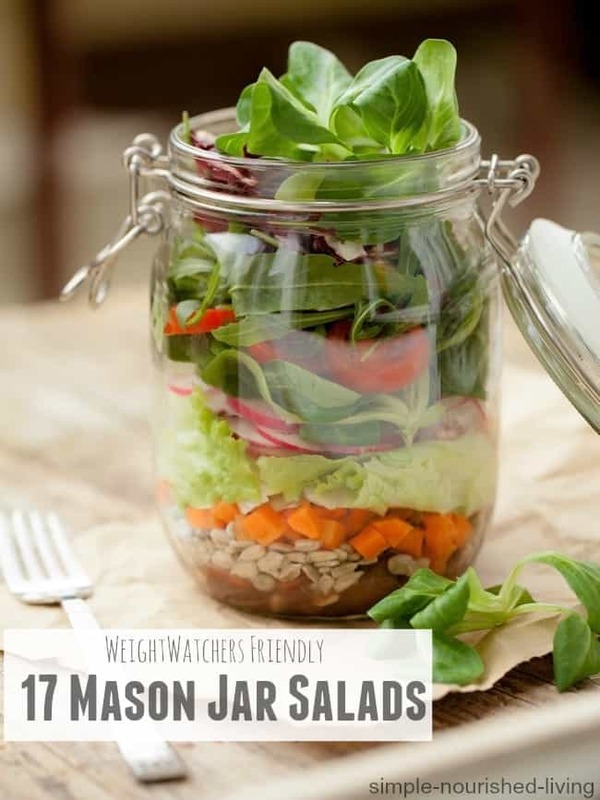 We have my sister to thank for this roundup of more than 17 yummy Weight Watchers friendly mason jar salads. She called me recently to share her excitement having just discovered them. I thought everyone knew about salads-in-a-jar. I was introduced to the concept of making a week’s worth of salads in mason jars at a Weight Watchers meeting several years ago. 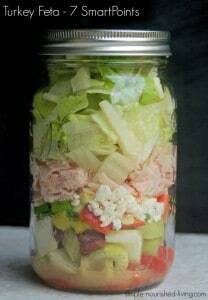 Salad in a jar is a simple and easy way to put together an entire week’s worth of healthy lunches in one fell swoop. They’ll stay fresh in the fridge for up to a week. The only real trick is to be sure to put the lettuce on the top and the dressing on the bottom to keep your salad from getting soggy. Just grab one and go! Shake it up, turn it out into a bowl, give it a toss and lunch is served! To be honest, I was a little slow to jump on the jam jar salad bandwagon. Since I work from home, I didn’t see the advantage of making salads ahead. Then I tried it and was hooked. Having salad ready and waiting is much more convenient than having salad ingredients available to turn into salad! The variety of salads-in-a-jar is endless. Use whatever ingredients and size jar suits your fancy. And they’re not just for summer. When the weather turns cooler, combine a pint jar of salad with a pint jar of soup. Tammy over at Organize Yourself Skinny has put together an amazing Ultimate Salad in a Jar Tutorial and Recipe Round Up including step-by-step instructions complete with photos. Layer 2: Hearty Vegetables Vegetables I have used are tomatoes, cucumbers, red onion, broccoli, cauliflower, asparagus, celery, carrots, peppers, and any other hearty vegetable you like. Hi, Martha! Thank you so much for linking to my Glowing Green Mason Jar Salad. What a fantastic blog and great collection of recipes. Thank you for the inspiration!